On a sprawling campus located on the outskirts of Seoul, South Korea, Hyundai and Kia just held a secret R&D show called the IDEA festival. The clue is in the name: this is a place for employees to show off some of their more imaginative ideas revolving around automation. 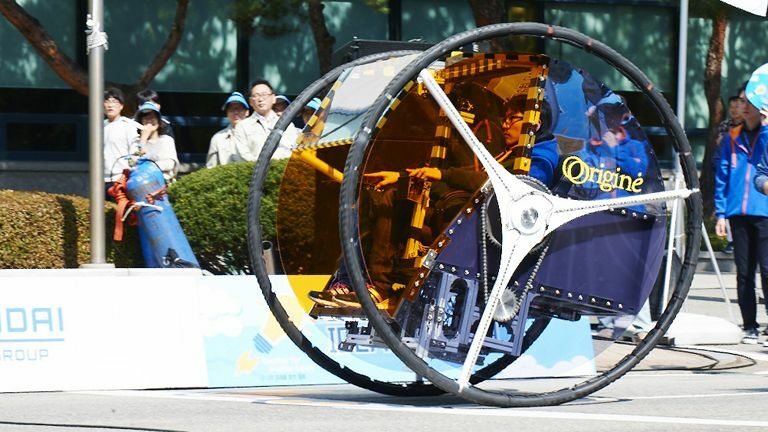 From remotely driving a car with a virtual reality headset, to a bike that cleans your clothes, some of the ideas shown off this year have the potential to be useful in the outside world, and we don't doubt Hyundai will invest . Until then, here are 10 projects that we got to see at the festival. Looks like a big toy, drives like a tank. The Origine is a two-wheeled vehicle that's about improving mobility, using two wheels that are each controlled by a separate joystick. This thing can traverse slopes and overcome small obstacles with ease, always keeping the driver positioned at the same even level. The current model can run for just over 20 hours on a single charge and move at up to 60kmph. The Life Zeppelin is an idea for delivering clean water to parts of the world, be it on crops or to people in need of drinking water. The small blimp, which stands at about seven feet tall, uses small propellers to fly up into the atmosphere. It then captures cloud vapour and turns it into clean water which can then be delivered to places where it's needed. Such a contraption could even be used in countries like South Korea and China to temper air pollution. The one we saw used just four propellers to make it fly, but more can be used where needed. Wearing an Oculus Rift while driving might not sound safe, but actually it could make you a better driver. Driving Experience is a tech prototype of a car that can be driven with the aid of virtual reality. A set of cameras mean that, while wearing the headset, the driver will still have full 360 degree vision, but they will also be able to see virtual objects out on the road ahead. This augmented reality experience would be useful for testing cars off the production line, driving around virtual cones to test the car's steering instead of having to set up a real physical course. There are other possible applications for this technology too, including using it for driving tests. The Solar Dream Team is a transformer for the developing world. The car can be expanded into a longer van which could be used to take someone to a hospital. The vehicle is also powered by solar energy - there are two panels on the roof - while the tail lights disguise two detachable bikes that wouldn't look out of place on a Bond villain's car. Finally, the extended version of the car can double up as a space for children to work and play in. This one might seem a little ridiculous at first, but we can see them being all the rage among parents in ten years time. The motorised buggy can be driven by somebody stood up, while anything from a stroller to a shopping cart can be pulled along behind. It's designed to be extremely mobile, but there are other neat features too, such as a sensor that will not only tell you if your baby is crying but why they're crying. It can even be driven using a smartphone. Neat. This is where things get a bit weird. The U Can car turns everything into a percussion instrument, from the steering wheel to the dashboard to the headrests. While it promises to make traffic jams a bit more interesting, we feel for the person who's stuck in the car next to them - or anyone in the car who doesn't fancy being part of a rather peculiar moving orchestra. If percussion's not your thing, there's a keyboard hiding in the glovebox, and you can even link up a smartphone or tablet for more instruments. Did we mention that parts of seats are bongo drums? This one also mixes virtual reality and driving, but much more ambitiously. Avatar Drive is a set of technologies that allow one person to remotely drive a car while wearing a virtual reality headset. We tried it ourselves, and can confirm that it was both bizarre and impressive. Say, for example, a friend had gone out and drunk too much, this concept would theoretically allow you to drive them home without them even touching the wheel. We were only able to drive a short distance during our demo, but we could see plenty of potential. The idea sits somewhere between modern cars and totally autonomous vehicles, and we could see it becoming the next evolution of, say, Uber. The team told us that the module could be used in any commercial car, but there's still a problem of connectivity: 4G isn't fast enough for something like this to rely on, so it won't be until 5G rolls around that we can hope to see this technology on the roads. Going by the current 5G roadmap, Avatar Drive could be a reality on some roads in 2020. The Wafrica Bike is also about bringing clean water to parts of the world that desperately need it. The bike doubles as a purifier; fill the container in the rear and then pedal away until it's clean. About a minute of pedalling will clean 2.5 litres of water, the team told us. But wait, there's more: another section in the back works as a washing machine. Just load in your clothes and your pedalling will turn the bike into a moving laundromat. Not the most thrilling idea on show, but another one that could be really useful for parents who are sick of fiddling with child seats. There are three parts to this. First, a pull-out seat that slides out the door, making it easier to put a child's seat on it. Second, an inflatable baby seas that will only pop up on command, letting it function as a normal passenger seat the rest of the time. However it's the third feature that's most impressive. A monitor in the back will let the baby see its parent's face (or whoever's in the driving seat) and vice versa. Or, they can put cartoons on instead. And let's face it, that's probably the preferred option. This creation, titled 'Car for the Disabled' is pretty self-descriptive. It takes any regular commercial wheelchair and attaches a motor apparatus that lets the user control the chair's movements with movement of the head and shoulders. Pushing the head back will make the chair go forward, moving it left to right will change its direction, and pushing back on the shoulders will make it reverse. The team says that right now you'll get about 20 hours of battery life out of it, but even when that runs out the chair can continue to be used manually - unlike many motorised wheelchairs, according to the creators.